Croatia has a great choice of activities and plaes to visit for a great family day out! From more adventurous activities like go-karting to more laid back things to do such as spending a day at the water or fun parks. Whatever your choice of activity, there’,s sure to be something to keep the kids entertained during your stay! Funtana Dino Park Located in Funtana, just South of Porec, is the Funtana Dino Park. The park has a number of large moving dinosaurs, a café,, a zoo, a few theme park rides, a gift shop, an arena which stages magic shows, a circus and animal shows, a fossil safari, childrens play area and dinosaur museum! Aquariums Porec Aquarium is located in the Old Town, and has 24 aquariums with flora and fauna from the Adriatic coast, with roughly 80 different species. Istralandia Waterpark This amazing waterworld is spread over 81,000m² and is located around 30 minutes' drive from Porec. There are 20 different slides, 1.6km of tubes and other various water-based rides and activities for all ages. It also has the largest wave pool in Europe! Mini Croatia Mini Croatia Park is a great way to explore the whole of Croatia in a couple of hours! The park was established in 2003 and displays the whole of the country over 5500m. The park also has a mini zoo for children. Go-Karting In Frata, just outside of Porec, is Istra Karting Motodrom. Built in 1999, the centre offers a safe and exciting environment for families and groups of friends who want to try something a bit different. The Green Garden Karting Centre in the Sijana Forest, around a mile from the centre of Pula, opened in 1997 and offers visitors private karting lessons as well as night driving. Paintballing is also available. Adrenalin Parks Adrenalin Park Glavani, located in Barban, around 30 minutes drive North of Pula, is one of Croatia's largest adrenaline parks. Experienced staff will talk you through the different courses, starting with the 2 metre course, then the 6 metre and finally the 10 metre courses, both of the latter finishing in a 113 metre zip-wire! 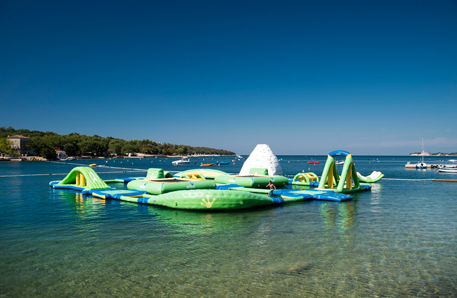 The adrenalin park in Umag, North of Porec, has a similar set of courses. Aquacolors Waterpark Croatia's largest waterpark has a great choice of slides, rides, pool and play areas to choose from, for all ages. The park is around 30 minutes' drive from Porec and is sure to be a hit with the kids!